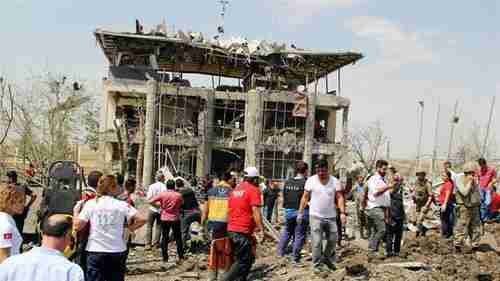 A large truck bomb exploded outside a police station near Turkey's southeastern city of Diyarbakir on Monday. Five police officers and two civilians, including a child of one of the police officers were killed, and another 21 were wounded. No one has claimed credit, but since the Diyarbakir region is a stronghold for militants from the Kurdistan Workers’ Party (PKK), there's little doubt that the perpetrators were from the PKK. Indeed, the PKK attacked the same police station five years ago. Diyarbakir police have been on high alert due to expectations that PKK militants would carry out an attack on Aug. 15, as the date marks the 32nd anniversary of the PKK’s first armed attack in 1984. In anticipation of a possible attack, police have been conducting operations against the PKK for five days, and have detained a total of 161 people suspected of being PKK members. There were 37 more arrests on Monday. Since that time, over 22,000 people have been arrested and almost 8,000 more are suspects under investigation. Thousands of members of the armed forces, police, judiciary, civil service and public sector have been removed from their posts. Around 50,000 passports were cancelled, journalists and academics have been arrested and more than 130 media outlets were shut down. There has been a growing sentiment in Turkey that the West was more concerned about those conducting the attempted coup, rather than Turkey's democracy. These concerns have apparently caused the public to put their political differences aside and unite behind Erdogan, blaming the West for humiliating Turkey. "The Turkish people are traumatized [by the failed coup]. Rather than helping Turkey, (European nations) are humiliating us. Turkey has made intense efforts like few other nations, to fulfill the conditions of accession to the EU. In return, Turkey has received only threats, insults and a total blockage. I ask myself, what crime have we committed? Why this hostility?" The major issue having to do with Turkey's relations with Europe is the EU-Turkey migrant deal, which has sharply reduced the size of the tsunami of Syrian refugees crossing the Aegean Sea from Turkey and arriving at Greece's islands. Under the terms of that deal, The EU committed to visa liberalization by the end of June -- allowing any of Turkey's 74 million citizens to be able to travel freely throughout Europe's Schengen zone without a visa. Turkey's president Recep Tayyip Erdogan said repeatedly that if visa liberalization isn't granted, then he'll cancel the deal and allow the full flow of Syrian refugees to Europe to resume. The end of June came and went, and there was no talk in the press about visa liberalization. Then the July 15 failed coup occurred in Turkey, and the whole subject was shelved, both because of the general chaos following the coup attempt, and because Erdogan's crackdown following the coup attempt raised numerous human rights issues that, according to the EU, had to be resolved before visa liberalization could proceed. "I don’t want to talk about the worst-case scenario but it is clear: either we apply all the agreements together, or we set them all aside. It can't be that we implement everything that is good for the EU but that Turkey gets nothing in return." There are many people in the EU who are opposed to visa liberalization for Turks under any conditions whatsoever. Cavusoglu this month referred to Austria as the “capital of radical racism” after Austrian Chancellor Christian Kern suggested ending EU accession talks with Turkey. A major remaining issue is that Turkey is accusing Fethullah Gulen, a 76-year-old Turkish Muslim cleric, living in self-imposed exile in America since splitting with Erdogan, of orchestrating the coup from his desk in Saylorsburg, Pennsylvania. Erdogan has requested that Gulen be extradited back to Turkey to stand trial for the coup. The Obama administration said that it is willing to extradite Gulen, but only after Turkey has provided suitable evidence that would withstand a court trial showing a connection between Gulen and the coup. Such evidence is probably not forthcoming, so this issue is far from resolution. A new report questions the wisdom of storing America's nuclear weapons at Incirlik Air Base in Turkey. Although the Pentagon does not discuss where its nuclear weapons are stored, it's believed that about 50 B61 tactical nuclear weapons are being stored at Incirlik. According to the Stimson Center report, the United States first deployed tactical nuclear bombs in Europe during the Cold War in the late 1950s and early 1960s, to offset a buildup of Soviet tank armies deployed in Eastern Europe. Although most U.S. tactical weapons were withdrawn from Europe during the early 1990s, 180 of the tactical versions of the B61s remain at six bases in Europe — in Belgium, Italy, Germany, the Netherlands, and Turkey. The report claims that storing the nuclear weapons at Incirlik is expensive. But more concerning is that the coup revealed "unanswerable questions" -- whether the US could have maintained control if the coup had succeeded, and whether the nuclear weapons are safe from terrorist attacks. Another report, from the Federation of American Scientists (FAS), also raises some concerns, but says the security situation is adequate, as they are guarded by US troops, and are stored securely underground. To steal or access these bombs, the report suggests, one would need to overwhelm US and NATO forces on one of their own bases, and then come up with some way to haul a 12 foot long, very heavy warhead.